We developed some stack laminated Accoya wood benches and an events bar for the area. We were recently commissioned by The University of Bristol to produce one of our charred Oak sail cube shelters. The Halls of residence needed an outdoor covered space. Our charred Oak Cube fitted the bill perfectly. 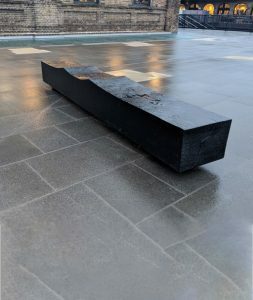 Our charred Oak Cube was erected and bolted to the paving of the halls, it features an Accoya wood splinter-free deck with a charred and scrubbed finish. The Top Gun Fabric sail was provided by the great guys at http://timberintent.co.uk. The sail is waterproof and flame-retardant. It adds the finishing touch to the Cube space. If you would like something like this on your next project why not get in touch? 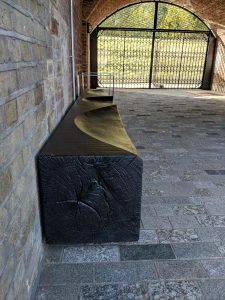 The design was developed around a bespoke rolled metal frame, which was manufactured and powder coated for us by Dmet a Dudley-based metal fabrication specialist. The benches feature a high back with trellis tops, integrated backrests, with free-draining seats. The benches are both maintenance-free and comfortable in use. 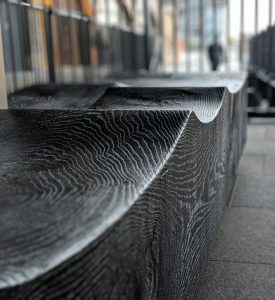 If you would like us to produce a one-off bench for your next project, get in touch! 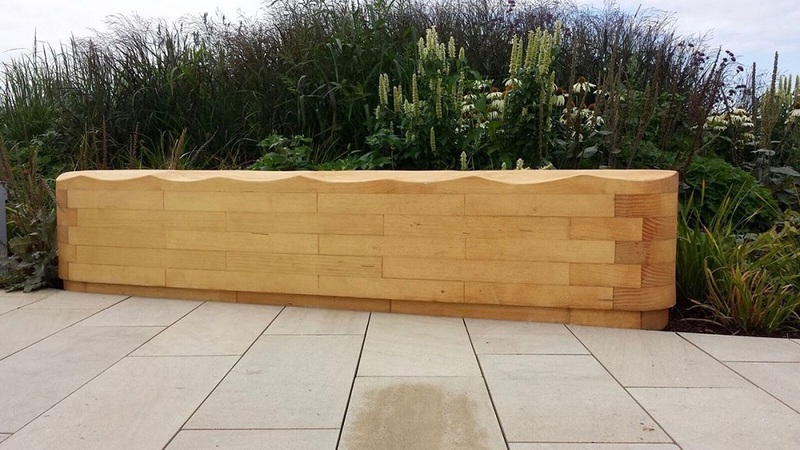 The Wave Bench is carved from a single solid piece of locally-sourced Green Oak, making it extremely durable. The natural finish complements any environment, and it’s maintenance free.